The opossum is an opportunistic omnivore, scavenging the flesh of dead animals (carrion), hunting small animals, and gleaning fruits and seeds. Insects such as grasshoppers, crickets, and beetles make up the bulk of animal foods, but these also include snails, slugs, earthworms, crayfish, small mammals, birds and birds’ egg, amphibians and reptiles. Plant foods, taken chiefly in late summer, autumn, and early winter include raspberries, blackberries, apples, acorns, beechnuts, and where available, vegetables, and grain. The opossum forages by searching rank vegetation, decomposing logs and stumps, and by climbing trees and shrubs. 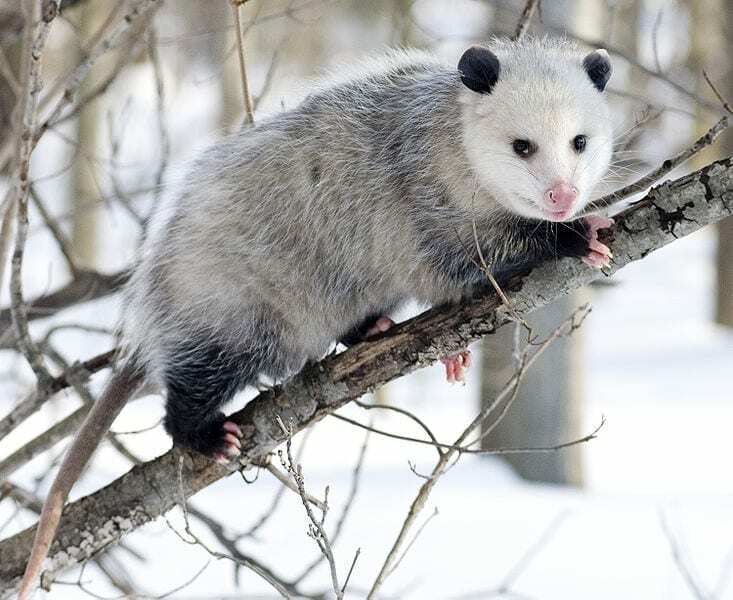 In urban areas, opossums may visit bird feeding stations to eat sunflower seeds, raid garbage cans or dumpsters for refuse, and consume food intended for dogs or cats. Opossums are crazy fastidious grooming animals like cats and when they find a tick, gulp- down the hatch. Researchers found many digested ticks in the feces of cooperative opossums. 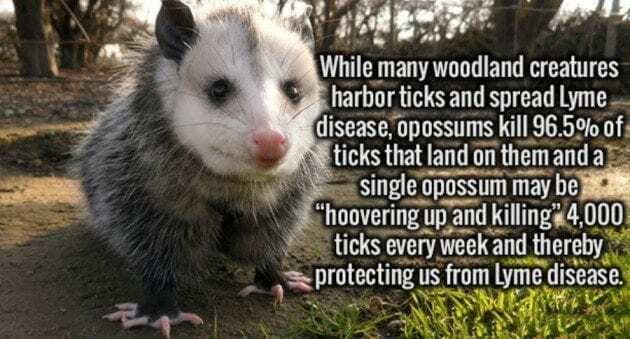 While they can’t get them all and certainly get bitten by a few, opossums will destroy some 90 percent of all the ticks they encounter. Knowing the effects of Lyme disease maybe the little mammals will get a better rap now in the animal world.